With heat and humidity common during summer months, the Ohio Department of Health and Aging, in a coordinated effort with the Ohio Committee for Severe Weather Awareness, urges everyone to use extra care in avoiding heat-related stress. 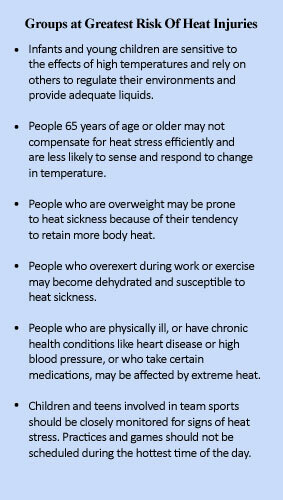 Several factors affect the body’s ability to cool itself during extremely hot weather. When the humidity is high, sweat will not evaporate as quickly, preventing the body from releasing heat quickly. Other risk factors include age, obesity, fever, dehydration, heart disease, mental illness, poor circulation, sunburn, and prescription drug and alcohol use. Studies show people suffer heat-related illnesses such as heat stroke and heat exhaustion when the body’s temperature control system is overloaded. Sweating is the body’s natural coolant. In some situations, especially during periods of high humidity, sweating alone will not provide an adequate release of body heat. Some medications affect the body’s ability to deal with excessive heat. People should avoid high-heat situations if their medication instructions so caution. Pet owners should make sure their animals, especially those outdoors, have plenty of water and a place to get out of the sun and cool down. Summer activities should be balanced with measures to help the body stay cool. Hot weather demands increased fluid intake. Drinking plenty of cool (not cold) fluids is the key to avoiding heat problems. Active people should drink two to four glasses of cool, nonalcoholic fluids each hour. Do not take salt tablets without a doctor’s advice; avoid fluids that contain alcohol or caffeine. They can add to dehydration and increase the effects of heat illness. Plan outdoor activities for either early morning or late evening, when the sun is less direct. Wear loose-fitting, light-colored clothing and a wide-brimmed hat to protect against sunburn. Move to the shade or into an air-conditioned building at the first signs of heat illness. Remember, heat-related symptoms can come on quickly. For heat cramps or heat exhaustion: Get the person to a cooler place and have him or her rest in a comfortable position. If the person is fully awake and alert, have him/her sip on a half glass of cool water every 15 minutes. Remove or loosen tight clothing and apply cool, wet cloths such as towels or wet sheets. Call 9-1-1 or the local emergency number if the person refuses water, vomits or loses consciousness. For heat stroke: Heat stroke is a life-threatening situation. Call 911. Move the person to a cooler place. Quickly cool the body. Wrap wet sheets around the body and fan it. If you have ice packs, wrap them in a cloth and place them on the victim’s wrists and ankles, in the armpits and on the neck to cool the large blood vessels. Watch for signals of breathing problems and make sure the airway is clear. Keep the person lying down. Never leave infants, children or pets in a parked vehicle, even if the windows are cracked open. To remind yourself that a child is in the car, keep a stuffed animal in the car seat. When the child is buckled in, place the stuffed animal in the front, with the driver. When leaving your vehicle, check the front and back seats to make sure everyone is out of the car. Ensure no sleeping children are left in the car. Heat Wave: More than 48 hours of high heat (90°F or higher) and high humidity (80 percent relative humidity or higher) are expected. Heat Index: A number in degrees Fahrenheit that tells how hot it really feels with the heat and humidity. Exposure to full sunshine can increase the heat index by 15°F. Heat cramps: Heat cramps are muscular pains and spasms due to heavy exertion. They usually involve the abdominal muscles or the legs. It is generally thought that the loss of water and salt from heavy sweating causes the cramps. Heat Exhaustion: Heat exhaustion is less dangerous than heat stroke. It typically occurs when people exercise heavily or work in a warm, humid place where body fluids are lost through heavy sweating. Fluid loss causes blood flow to decrease in the vital organs, resulting in a form of shock. Signs of heat exhaustion include cool, moist, pale, flushed or red skin; heavy sweating; headache; nausea or vomiting; dizziness; and exhaustion. Body temperature will be near normal. Heat Stroke: Also known as sunstroke, heat stroke is life-threatening. The victim’s temperature control system, which produces sweating to cool the body, stops working. The body temperature can rise so high that brain damage and death may result if the body is not cooled quickly. Signals include hot, red and dry skin; changes in consciousness; rapid, weak pulse; and rapid, shallow breathing. Body temperature can be very high – sometimes as high as 105°F. Medical attention is necessary.